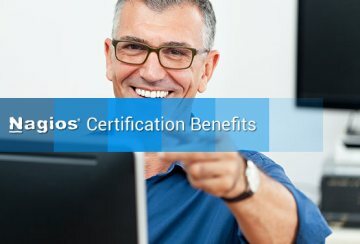 Nagios Certification. Get a better job. Get Nagios Certified. The Nagios Certified Professional – Core certification exam is designed to test the skills of an individual who uses Nagios Core on a frequent basis. This individual should have a good understanding of how Nagios Core works, as well as knowledge of monitoring terminology. Topics covered include handling outages, investigating incidents, acknowledging alerts, scheduling downtime, generating reports, and general use. Designed for IT professionals, administrators, helpdesk staff, and end users. The Nagios Certified Administrator – Core certification exam is designed to test the skills of an individual who is responsible for managing the day-to-day operations and maintenance of a Nagios Core installation. This individual should be capable of designing, implementing, and supporting a Nagios Core installation. Topics covered include graphing and trending, distributed monitoring, passive checks, performance tuning, agents, and other advanced topics. Designed for IT professionals and administrators. Nagios will then send you your login credentials and instructions to schedule your exam within one business day. Login to your account and confirm your profile information, then schedule your exam. Verify your security profile after scheduling your exam and well before your exam date. At the time of your exam you must have your credit card ready for purchase. On the day of your Exam: have your credit card ready – you will purchase your exam at the exam start time. Login to your account and Open Test Portal – this will bring you to the proctoring site where you will pay for and take your exam. The proctor will stay online with you while you take your exam and be available to assist with questions. 1-2 weeks after you take your exam, we’ll contact you with information about obtaining your certificate. You can verify your certification status and obtain certificates online. A well-working computer with 1 GB of RAM or higher. A wired high-speed internet connection (3 Mbps). A wireless internet connection is not recommended. Any webcam with 640×480 video pixel resolution (a laptop camera is acceptable). Working speakers connected to the computer. A microphone connected to the computer (consider a webcam with a built-in microphone). Flash player version 7 or higher. Browser compatibility: IE, Firefox, Chrome, Safari. Discounts of 10% on future support plans and product licenses. Certificates Of Completion – Professional receive a certificate from Nagios Enterprises once they’ve successfully achieved a certification level. 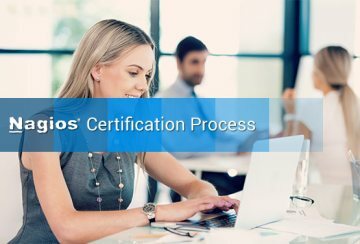 Professionals can let their current and future employers verify their official Nagios certification status and obtain certificates online. 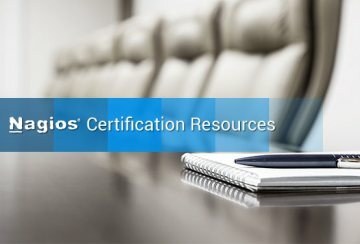 Our certification prep guides help prepare you to successfully understand Nagios and pass your exam. These guides are available on the Nagios Library. This 150-page guide is designed to prepare the reader for the Nagios Certified Professional – Core certification exam. The guide covers aspects understanding Nagios Core and using its features and functionality on a daily basis. This 160-page guide is designed to prepare the reader for the Nagios Certified Administrator – Core certification exam. The guide covers aspects of installing and managing Nagios Core on a daily basis.